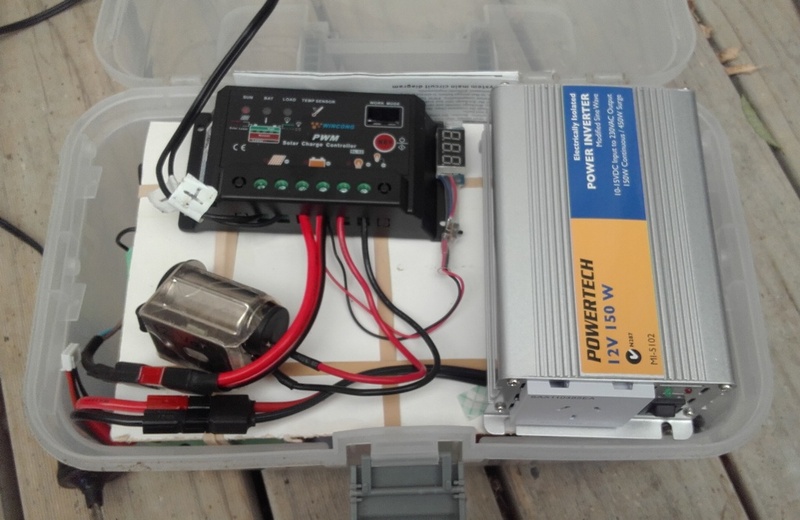 In order to increase the usefulness of this little solar power box I've added a DC-DC 19V booster so I can run my laptop. This has the benefit of ensuring the system is working properly (rather than just leaving it and forgetting about it), and it reduces my evening mains power consumption a little bit. I also use it to recharge my phone. 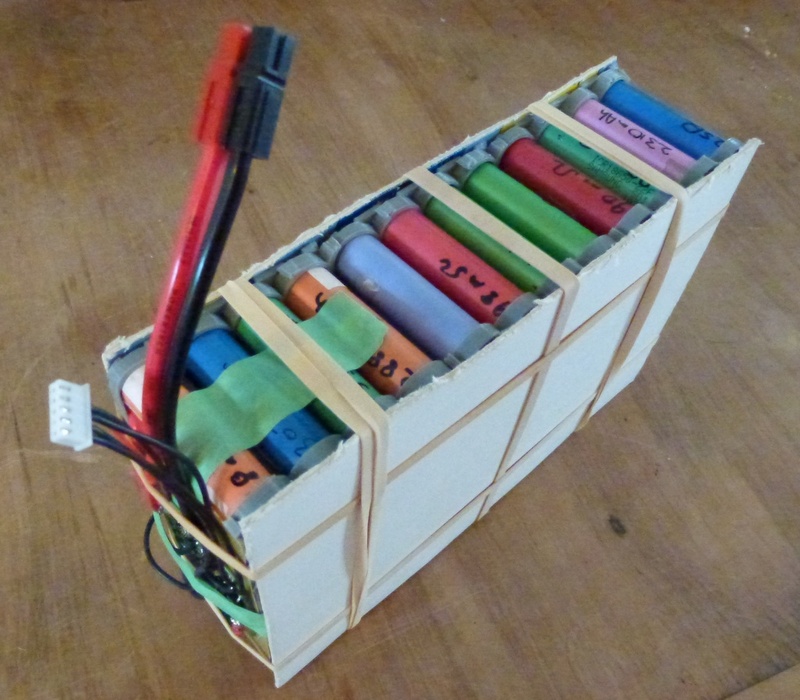 I'm upgrading my solar powered Small Emergency Power Box with a lithium pack made from recycled laptop batteries. Here it is half built - with my interlocking 3D printed 2*4 twin cell holders. And completed with BMS. I'm waiting for a new solar charge controller that does lithium batteries. 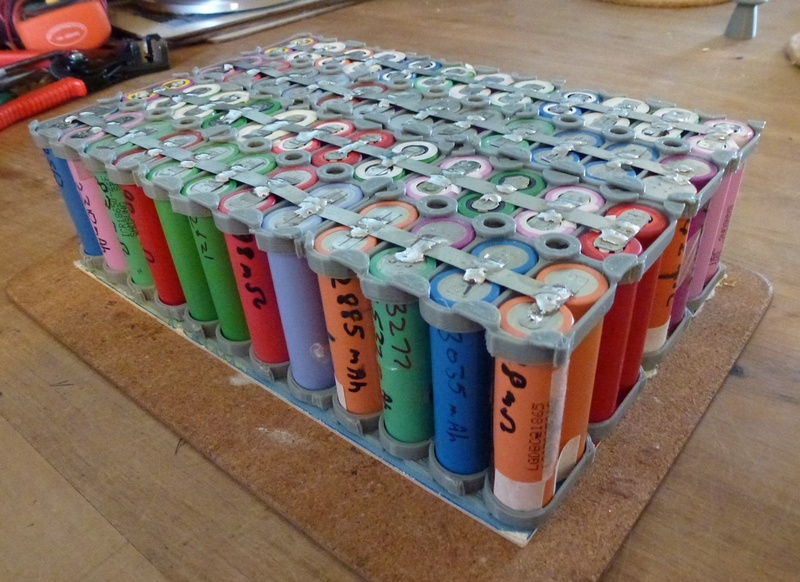 This pack is made from the lower capacity cells I've recovered from recycled laptop batteries. This is the best use I could think of for these cells. Their individual capacities ranged from 1000 mAh up to 1500 mAh. The capacity of the 4 groups of cells arranged to give 32.81, 32.72, 32.66 and 32.77 Ahrs - so hopefully that's balanced enough to reduce unbalanced charging. I should probably switch to using a balancing BMS at some point. I'll monitor this pack to see how quickly it drifts out of balance. My assumption is that the recycled (and mismatched) cells will drift faster than a pack with homogeneous cells. And of course these old cells will loose capacity a lot faster than new cells. The only think that makes using recycled cells worthwhile is that they are cheap enough. If this setup works well I'll build another two similar systems for Project Ramaka and the HappySimply tiny house. The solar charge controller (Wincong SL-02A 10Amp, Ver 1.1) arrived and it's now connected up. For a power box like this I want the batteries to last longer over time rather than hold maximum capacity. The rule of thumb for "power wall" situations like this is; only charge to 80% full capacity and only discharge down to 40%. If I keep the battery charge state between those bounds the pack should last longer. But... given the cells are used - I really don't know how long that'll be.